These seven sorrows are often represented in art by a sword -- or seven swords -- piercing Mary's heart. This relates to the prophecy of the old man Simeon we heard about at Candlmas, when, after Our Lady pesented the Child Jesus to him, he told her, "Behold this child is set for the fall, and for the resurrection of many in Israel, and for a sign which shall be contradicted; And thy own soul a sword shall pierce, that, out of many hearts, thoughts may be revealed." 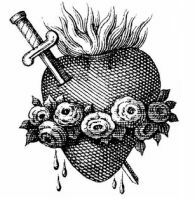 The Seven Sorrows are meditated upon in the Franciscan Crown prayers, a timely thing to pray. But, as said, the Seven Sorrows are more the focus of the September Mass with this them. The Mass today focuses more on her compassion and what she suffered during the first Passiontide. In other words, the feeling of the day is akin to what one feels when looking at Michelangelo's Pieta. To that end, the Sequence read after the Epistle, Gradual, and Tract consists of the haunting Stabat Mater, the text of which was written by St. Thomas Aquinas. In some places, a "Via Mater," like the "Via Crucis" ("Way of the Cross") may be found, with seven stations at which one may see artistic representations of and meditate on each of Mary's sorrows. Such a devotion can be made in one's Mary Garden or home if it isn't publicly available. In many parts of Mexico, it is custom to set up an altar to Our Lady of Sorrows, with her image, white candles, chamomile flowers, pink flowers, and calla lilies (there are so many Catholics in Mexico, that the people in neighborhoods make tours of each others' altars, and fruit drinks are served to visitors. Public, communal altars are set up, too.) This custom provides a break in the veiling of images. Every life has elements of mixed joy and sorrow. Certainly Mary and Joseph are filled with joy as they travel the day's journey from Bethlehem to Jerusalem to offer Mary's First-Born to the service of His Father. According to Jewish custom, they "ransomed" Him back by offering two turtle doves as sacrifices to Almighty God. The joy of Mary seems to overflow as the aged Simeon receives her in the Temple and, taking the Child from her arms, looks heavenward with praise to the Almighty for sparing him until he saw the salvation "prepared before the faces of all peoples: a light of revelation to the Gentiles and a glory for Thy people Israel." From the height of her joy, Mary's heart suddenly sinks, as Simeon glances first to the Child, then straight into her eyes. "This Child is set for the rise and the fall of many ... a sign of contradiction . . . thine own soul a sword shall pierce . . ." Mary knows that her Son is to suffer. She knows that He will be lifted up. Simeon makes it painfully clear, as he reminds her of her Son's mission. "She pondered these things in her heart." O, Mary, help me to understand the purpose of suffering in my life. After returning to Bethlehem, the Holy Family is visited by the Magi. Shortly after their departure, Joseph is warned by an angel to "take the Child and His Mother and flee into Egypt." Already, jealous Herod's soldiers seek the Child. Joseph and Mary hurry a few blocks from their temporary home to a nearby cave, where Mary nurses her Babe in what has since become known to the local people as the "Milk Grotto." As they continue their journey out of town and head towards the Egyptian border, the terrible sounds of the slaughter ring in Mary's ears. Even Rachel mourns from her grave the Innocents of Bethlehem. Mary wonders: "Is this to be His time, at this age?" The only alternative is to flee quickly to the unfriendly Egyptians, the former captors of her people. Is it possible that only the Sphinx looks down in silent approval as they pass into Pharoah's land? Jeremia the Prophet speaks for Mary: "Bitterly she weeps at night, tears upon her cheeks, with not one to console her of all her dear ones; her friends have all betrayed her and become her enemies. 'Look, O Lord, upon my distress: all within me is in ferment, my heart recoils within me from my monstrous rebellion. In the streets the sword bereaves, at home death stalks. Give heed to my groaning; there is no one to console me.' " And yet, through this trial Mary still has Emmanuel with her. She knows that all will be accomplished in God's time. This gives her the security of peace in her sorrow. The Scripture will be fulfilled: "I have called My Son out of Egypt, that salvation may come to Israel." O, Mary, help me to stay close to your Divine Son when I feel most abandoned. Again, the joy of traveling, this time for several days, from Nazareth to the Temple in Jerusalem for the great feast. These were especially happy times for Mary, reunited with her own people, living with Jesus and Joseph. The feast ends; the return to Nazareth commences in the early morning. The caravan of women moves ahead north of the Holy City. The men follow in their caravan. They sing Psalms praising God, exchange news and laughter, as the trip progresses. Both groups meet in their encampment at the end of the day. As night falls, Mary and Joseph find each other and realize with horror that Christ is not in their company. They search through both camps to no avail. "Have you seen Him? He is only twelve years old." Each time the reply is negative. Mary remembers the words of Simeon and the Lamentations of Jeremia the Prophet: "The Lord has done as He decreed: He has fulfilled the threat He set forth from days of old; He has destroyed and had no pity, letting the enemy gloat over you and exalting the horn of your foes. Cry out to the Lord; moan, O daughter of Sion! Let your tears flow like a torrent day and night; let there be no respite for you, no repose for your eyes." Mary feels terror and panic. "This must be His hour," she thinks. In His boyhood hurts, even in the flight to Egypt, Jesus was with her. Now, for the first time, He is gone. Nonetheless, she knows that the Eternal Father knows all things, and this gives her peace. Her confidence is rewarded three days later when she and Joseph find Jesus in the midst of the doctors in the Temple. O Mary, help me to keep peace of soul, even when searching for Jesus in my life. It is coming soon. She senses that now. The Pharisees have become increasingly resentful towards Him. She is praying over these things when the knock comes at the door. "They have taken Him! They have taken Him!" She wraps her veil tightly around her face and runs into the night with her friend. They reach Caiphas' house in time to see Jesus pushed up the steps. She overhears Peter: "I know not the Man!" She meets John, who leads her towards the praetorium of Pilate. She waits through the night as reports are brought to her of Jesus' scourging. Once again Simeon's words thrust at her as so many arrows. She prays the psalm: "My heart has become like wax melting away within my bosom." The long night passes into gray dawn and still she keeps her vigil. Then she hears Pilate's words to the crowd from the arch: "Behold the Man!" She can scarcely recognize Him as the crowd roars for His death. He does not yet see her. She wants it that way— to spare Him the pain. She sees the rough cross-timber dragged to a point below the arch. She watches the soldiers laughingly lead her Son to the cross. He can scarcely walk. He stumbles, He falls—He opens up more wounds, as if that were possible! She sees the seamless robe she has woven for Him years ago- now a mass of blood and flesh, clinging to His Body. His face is misshapen and swollen. She cannot move. He is pushed forward by the soldiers. He walks a few more feet, and then He sees her! Mary does not restrain herself. She kisses Him softly through her tears and reminds Him of her love for Him. "Their looks became as swords, to wound those hearts which loved each other so tenderly." O, Mother of God, teach me to behold Jesus in His sorrows when I am most tempted to sin. Through you, O Virgin Mother, may we draw the waters of salvation out of the wounds of Christ. "Joseph of Arimathaea requested the body of Jesus, which he took down from the cross. And His Mother received it into her arms. The sorrowing mother took her dead Son and laid Him on her knees" (From the Divine Office of the Feast of the Seven Sorrows). To and fro upon its billows. In her arms her Jesus holding. Torn so newly from the Cross. Oh, that mournful Virgin Mother! All her melting soul is gone. Which afflicted thee of yore. O, Mary, help me to stand beside the Cross with you, whose soul the sword of sorrow has pierced. They place Jesus' body on a slab and quickly anoint it. From there they carry it to the tomb of Joseph of Arimathea. There, once again, Mary arranges the folds of the winding sheet with her own hands. The tomb is closed and the mourners leave. "Depart from me, I will weep bitterly; labor not to comfort me. There is in Him no stately bearing to make us look at Him, nor appearance that would attract us to Him. From the sole of the foot to the head, there is no sound spot in Him." "To what can I liken or compare you, O daughter of Jerusalem? What example can I show you for your comfort, O Virgin daughter of Sion? For great as the sea is your downfall." Yet Mary's deep sorrow did not overshadow her faith in Jesus or her hope in His promise. His death was her hope of resurrection. Jesus 's wounds and Mary's woes. Peace and pardon well may win! Endless joys in Heaven above. Worship Thee forever more. Amen. O, Virgin Mary, may your many sorrows make me rejoice in Heaven's Kingdom.